The In betweens, 2014. Performance and public interventions. 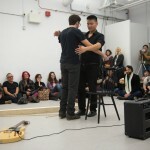 7a*11d performance festival, Toronto. Approx. 30 minutes. 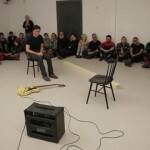 Christian Bujold interacted with two chairs, a pile of 8' x 3/4'' plywood sticks, the public and the feedback created from an amp and an electric guitar lying on the floor. 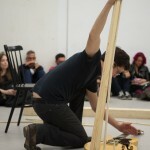 The actions aimed to create tensions and resonance interactions between all of the elements. The feedback sound reached peaks and could suddenly be muted by Christian Bujold. 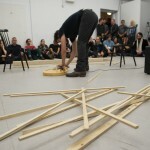 The actions layout was opened and depended on the kind of interactions or non-interactions he would undertake with the objects as well as with the audience. 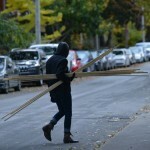 In public space, Christian Bujold held several plywood sticks between his body and architecture elements. He held the tension until the sticks broke down. Then, he would leave the stick behind and continue until all the sticks where broken. 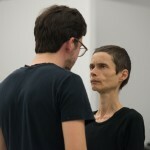 Les Entre-deux, 2014. 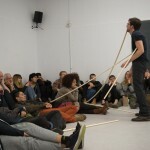 Performance et interventions dans l'espace publique. 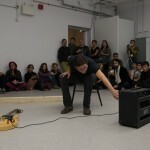 Festival de performance 7a*11d, Toronto. Durée approx. : 30 minutes. 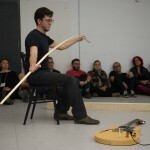 Christian Bujold interagissait avec deux chaises, une pile de baguettes de contreplaqué de 8' x 3/4'', les membres du public et le son issu du feedback entre un amplificateur et une guitare électrique déposée au sol. L'ensemble des actions cherchait à créer un réseau de tensions et résonnances créées par les interactions entre tous les éléments. Le son du feedback devenait périodiquement très puissant et pouvait être interrompu par Christian Bujold à tout moment. La séquence d'action n'était pas scénarisée et dépendait ainsi des interactions et non-interactions qu'il souhaitait provoquer avec les objets ainsi que les membres du public. 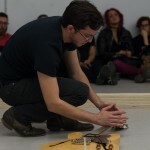 Dans l'espace publique, Christian Bujold tenait plusieurs baguettes de contreplaqué en tension entre son corps et certains éléments d'architecture extérieure. Il tenait la position jusqu'à ce que les baguettes cassent. Ensuite, il laissait les baguettes brisées sur le sol et continuait ainsi jusqu'à ce que toutes les baguettes soient cassées. I’m looking for Christian Bujold. It’s after 3 pm, and he’s scheduled to be performing but I can’t find him anywhere. Popping my head into rooms and looking down hallways, I turn a corner and nearly take a stick in the eye. 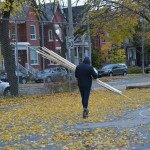 He’s here, with his back to me, picking up a pile of plywood sticks each about 8 feet long. Slinging the bundle over his shoulder he turns and heads outside. Watching from the second floor window, I see him on the sidewalk. He’s glancing around, and looks toward the park. Turning he instead heads down toward busy Queen Street. Swivelling his sticks he walks south and out of my sight. I decide I’ll try and find him later. It feels like, for now, he’d rather be alone. There’s a trail. Broken sticks on the side of the road. I find Bujold pretty quickly. He’s not as hard to locate as I thought he’d be. 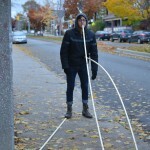 There’s a small crowd and about five cameras documenting his actions, and in this moment his movement involves leaning his body onto plywood sticks that are jabbed between the sidewalk and his stomach and his face, visibly cutting into his upper lip. 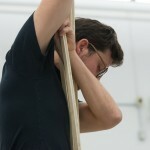 Both sticks are arched and bowed in support of his weight, and he’s holding the tension. For a moment I sense that the mood has shifted. It’s like he’s in his comfort zone. I remind myself that I was going to stay away, so I cross the street to give him space. It feels weird being too close. Today, Bujold has been cagey. In speaking to him about his performance earlier in the day, he said he didn’t really want anyone to know what he’d be doing. Despite this, word got out anyway and a dozen people have gathered. But even though he’s in plain sight, there is still a sense that he’s trying to hide. Hoodie up, Bujold stands on the corner of Shaw and Queen. 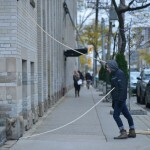 He places one stick between his ear and the brick building to his left. 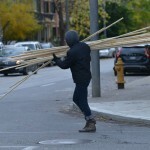 These sticks are used by Bujold as a sort of architectural device, a way of extending himself to the city. 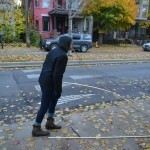 Paradoxically, the sticks are simultaneously opening as they are obstructing; pedestrians have to walk out into traffic in order to give Bujold a wide berth. No one wants to invade the proxemics of his embodied articulation. After each stick snaps, he picks up the bundle and moves on. Placing one stick to both his left and his right, he suspends himself between a pair of barren flower beds. Moving to the corner of a building to prop a stick against a security camera, he connects it to his forehead as if in challenge—do you want to see inside? 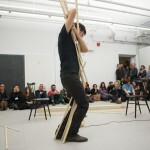 These plywood sticks place the artist in relation, physically manifesting the anxious tension of interacting. Bujold leans into the moment and hopes to hold it as long as he can before it breaks. 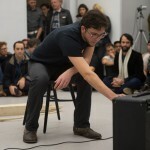 Akin to a meditation, it is different in that his movement is rooted in the pragmatic. The tension is held but the material can never sustain. Despite all our efforts, the elegance of mutual support can always give way. These moments in life can’t last forever, he seems to be saying, so lets linger for as long as we can.